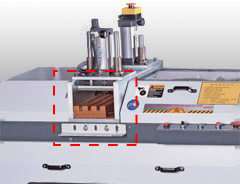 Horizontal cutting and Saw moves on linear guide way, that assures accurate and large cutting. Work piece clamping pressure is adjustable to eliminate material deformation problem. 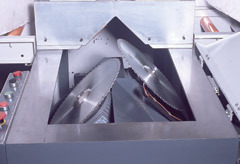 Automatic oil mist cooling for saw blades provides burr-free surface of cut, while extending saw blade life. Alternatively saw blades straight feed in horizontal direction allows large cutting width. 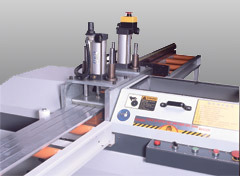 Equipped with wear-resistant linear motion guides for accurate angle of cut. Cutting angle is easy to adjust. Gap between gauge and saw blade is adjustable no burr after sawing. The machine performs a 45 degrees miter cut. 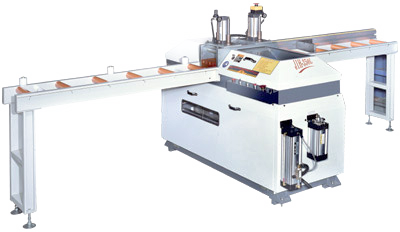 Designed for high speed cutting of extrudes strip, door and window frames. Horizontal cutting and saw move on linear guide way, that assure accurate and large cutting.